Towel waste is a costly problem. Some building service contractors state that wasted paper can cost upwards of 20 percent of their supply budget. Even if BSCs bill their clients for their paper products, waste is still a problem. BSCs will be forced to ask for a higher reimbursement rate and no facility manager welcomes that. Plus, there are the costs of labor spent on restocking and the bad image supply shortages could create. Fortunately, there are solutions available to help BSCs curb the amount of wasted paper products. To know which resources to choose, BSCs first need to identify who is creating the waste. Bad habits The main culprits for towel waste are the restroom patrons. Their crime: Taking too much toweling. On average, two multi-fold towels or 1.5 feet of roll toweling is sufficient to dry hands, says Steve Garcia, CBSE, vice president, SMI Facility Services, Albuquerque, N.M. However, most patrons use roughly twice that amount, he says. Users take too many towels out of habit. So, the best way to curb overusage is to cut off the user, say BSCs. “Otherwise, they’ll crank until the cows come home,” says Robert Ferreira, co-owner, Admiral Building Service, New Bedford, Mass. Ferreira recommends installing touch-free dispensers, preferably one activated by a hand sensor. Garcia agrees. BSCs also can remind users that waste is detrimental to the environment. A simple statement such as “reduce your use, save a tree” emblazoned on the dispenser can reduce usage considerably, says Garcia. Absorbency If changing dispensers is too expensive, BSCs can try more absorbent toweling first. Cheaper paper often results in higher usage, says Kim Jones, senior project manager at Sprint World Headquarters Campus in Overland Park, Kan., a Woodley Building Maintenance account. However, switching to a better, more absorbent towel won’t immediately reverse the problem, she adds. “Once a person realizes that it takes four to five towels to dry [his] hands, it will take months to change that habit if a higher quality of towel is substituted,” says Jones. Eventually, however, patrons will realize the new paper towels are effective with only one to two towels and waste will decrease. To help patrons realize the increased absorbency faster, towel-dispenser manufacturers recommend combining the new toweling with a dispenser that features a delay mechanism. By the time users reach for another towel, they will realize their hands are already dry. When upgrading to higher absorbency, BSCs should consider the texture and softness of the paper, not just its thickness, says Jones. “A stiff or rough surface will not absorb as well as a softer surface. A good example would be a bed sheet and a softer paper towel. They are both thin, but bed sheets are not absorbent,” she says. Other culprits Of course, restroom patrons are not the only contributors to towel waste. Many times, BSCs’ biggest wasters are their own staff. One problem is needless roll replacements. Often, janitors change out the toweling in a restroom every night, regardless of consumption and how much is left on the roll. But, janitors also can’t leave stub rolls in the dispenser because this is typically too little toweling to meet demand. One solution is a dispenser equipped with a stub-roll feature — a new roll of toweling will automatically be fed through the dispenser once the smaller stub roll runs out. Another problem can be staff who don’t pay attention to towel-dispenser flaws. Some folded towel dispensers require janitors to tuck the towels into each other when refilling the dispenser, says Jones. If janitors don’t spend the time, several towels can come out at once. Replacing existing dispensers in favor of ones with waste-reducing features may be a tough upfront cost for BSCs or their clients to bear, but when balanced with the savings from purchasing fewer supplies, both parties should profit from the change. 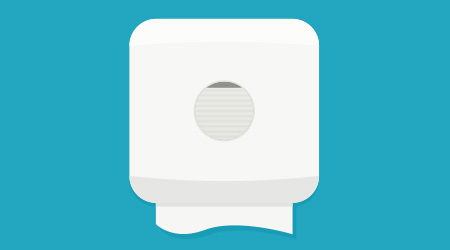 Towel dispensers with a sensor delay are a popular solution to reducing towel waste. Unfortunately, the same technology can’t be applied to toilet tissue. No restroom patron wants to wait even five seconds for their next installment or be told how many sheets they can use at a time. However, some dispensers are equipped with “breaking mechanisms” to prevent users from taking long ropes of tissue at once, say dispenser manufacturers. These mechanisms put friction on the roll and after a few sheets of tissue, the tension will cause the perforation to break. In other dispensers, the weight of the jumbo wheel is heavy enough to tear through the perforation. A lot of toilet-tissue waste comes from stub rolls, so many BSCs use jumbo rolls to serve more patrons with fewer refills. “Jumbo rolls reduce labor and help maintain positive customer satisfaction in requiring less frequent replacement,” says Kim Jones, senior project manager, Woodley Building Maintenance, Kansas City, Mo. High-traffic restrooms may require dual-roll dispensers to meet the demand. Some dispensers are equipped to hold a stub roll and a new jumbo roll to ensure all tissue is used. Jumbo rolls also help deter theft. In environments such as foodservice facilities, extra smaller rolls are made available in case the dispenser runs out, but these spare rolls are often stolen by patrons instead, says Robert Ferreira, co-owner, Admiral Building Service, New Bedford, Mass. Another option to help prolong the time until refilling is coreless tissue rolls. Instead of a cardboard core taking up empty space, tissue fills that hole. More paper is available in the same size roll, meaning more restroom patrons can be serviced.